Here in the UK the British Robin is our national bird. And with good reason - these enchanting little creatures make bold and fun garden companions. Their numbers don't seem to have been dented by the loss of natural habitats which is a result of increased development, particularly in England. 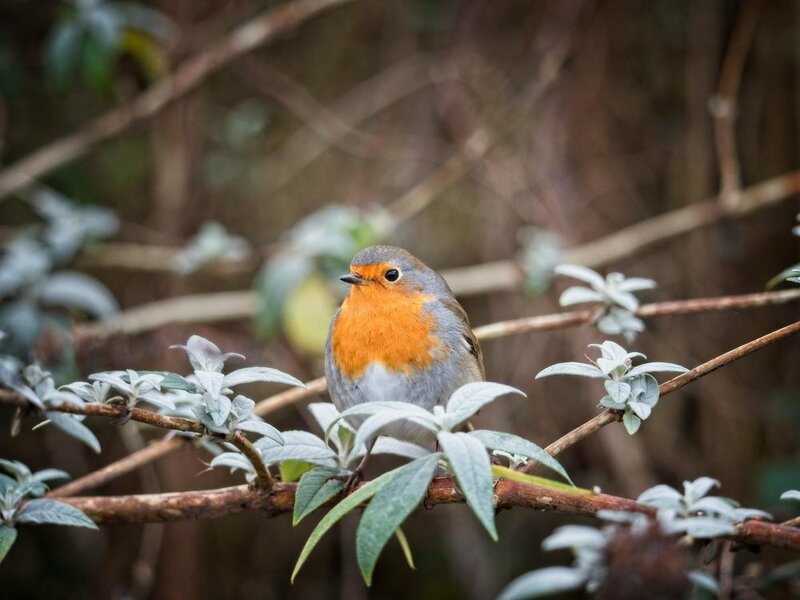 Pictures of these little birds adorn Christmas cards and it seems an appropriate time of year to offer a tribute to them and to share some interesting facts about the Robin Redbreast. 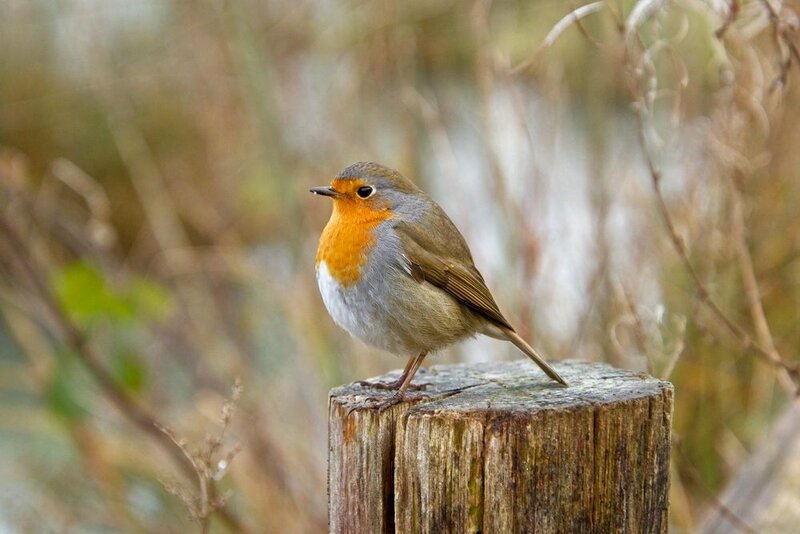 There are various birds in the world which are referred to as ‘Robins’, although they bear no genetic or behavioural resemblance to British Robins. Robins are members of the Thrush family (as are Blackbirds). Both male and female Robins have their own territories during the winter, and both sing. They tend to pair up in December. They don't live very long unfortunately, although that’s apparently due to cats and fights with other Robins thanks to their very territorial nature. Robins tend to produce around three broods per year, sometimes more. Their diet is quite varied ranging from worms, berries, and insects. Apparently their favourite treat is mealworms, although my Robin won't eat these for some reason and prefers small piece of cake or crumbs of unsalted cheese. One of the features of Robins which has made them so popular here in the UK is the fact that they are so easy to tame. All you need to do is take some appropriate food out with you, at a predictable time of the day. Start by placing the food a few feet away from you in a place where your Robin normally hangs out. Then gradually move the food closer to you and the bird will soon become accustomed to your presence. The next step is to place the food on an open palm resting your hand at a distance. With only a small amount of practice, your Robin will soon greet you and will happily keep you company. My Robin feeds from my hand without any of those intermediary steps which just goes to show how confident they can be. A few years ago I had a Robin which showed absolutely no interest in hand feeding, but was fascinated by my every movement. Every time I stepped out of my back door the Robin would appear and would follow me around at very close proximity. This included entering the garden shed, the garage, and at times the house. I can tell you from experience that getting a curious Robin to leave is easier said than done, especially if it manages to make its way upstairs. This same Robin got to know my daily routine and as soon as it saw my bedroom blind twitch first thing in the morning it would land on the windowsill and burst into song. Then it would appear on the bathroom windowsill as soon as I entered the room. Likewise the kitchen windowsill by the time I'd made my way downstairs. This was a little disconcerting but it does prove just how nosy these little characters can be. Food wasn't the motivation because I would wave treats two inches from its beak only to be ignored. 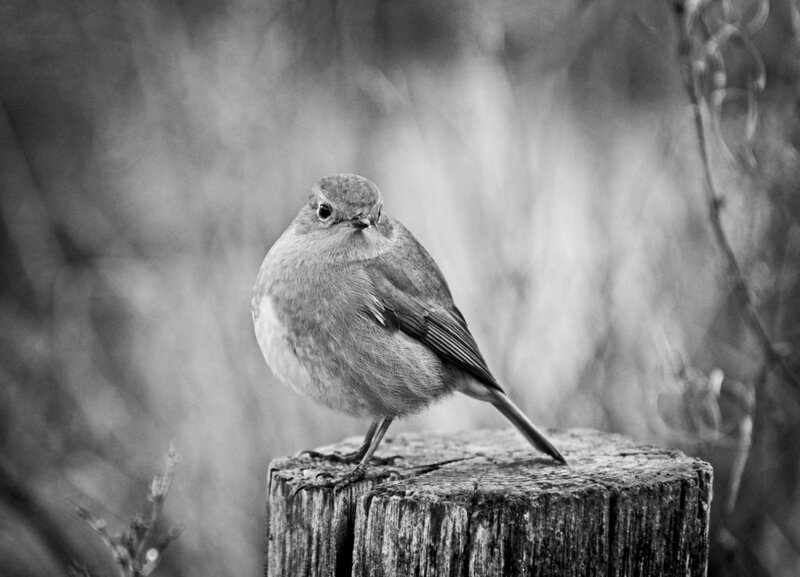 The Robin in the photographs below was snapped a couple of days ago on one of my favourite walks. 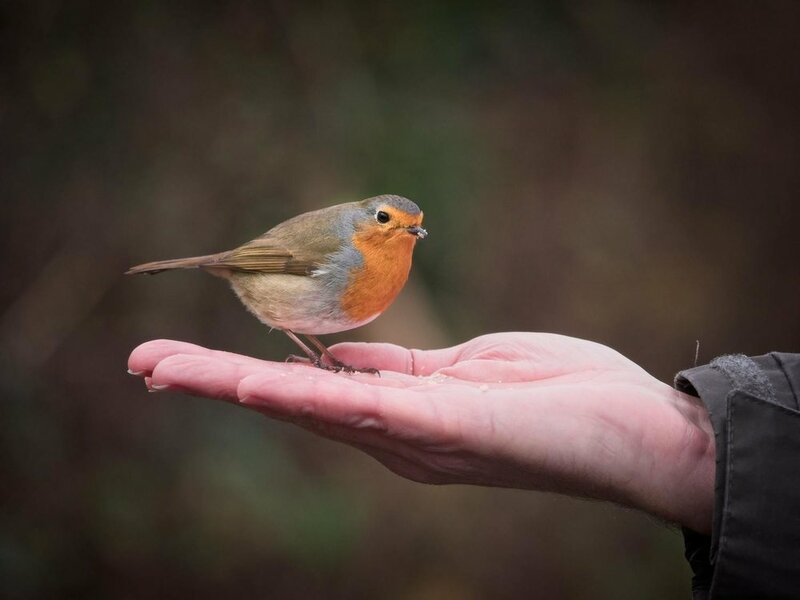 Unfortunately the food I had with me that day was suited to larger birds and the Robin didn't hesitate to tell us that by staring pointedly at the seeds and then glaring at the face of the human offering his hand. This resulted in the Robin staying firmly in situ until we could gently encourage it back onto a fence post. The Robin then kept as company for most of the morning. Male and female Robins look exactly the same to my eyes, there appears to be no difference in size or plumage. But apparently females have a slightly V-shaped red brow and males have a U-shape. The markings on this particular Robin appear to be something in between, so I'm none the wiser as to its gender. During the mating season males can be seen feeding females, but if you see the Robin on its own you still won’t know who is who. So if you have a Robin in your back yard, now is a good time to make friends with him or her. Hand feeding a small wild animal feels lovely and is so relaxing - give it a go (unless you have cats who regularly visit your garden). It's also nice to know that over the years the descendants of your Robin are very likely to remain in their existing territory, they rarely move far from where they hatched. Because these little birds are easy to tame they’re also fairly easy to photograph. You can get very close to them which is half the battle. But like most small birds they’re prone to constant micro-movements, particularly their heads. So even though they may be standing in one place you'll still need a reasonably high shutter speed both for handholding a telephoto lens and for freezing movement of your Robin. For the photographs below I was working between 100mm and 160mm. In Canon APS-C terms that is ‘equivalent’ to 160mm to 256mm. My shutter speeds varied from 1/200 to 1/500 which was enough for sharp photographs given that the lens I was using (the Canon 55-250mm STM) has a degree of stabilization. This was mounted on a tiny DSLR, the Canon 200D making for an extremely lightweight but well performing setup.